It's a beautiful thing that Russian River beers are now distributed in Oregon. I tried a Blind Pig IPA for the first time recently, and really enjoyed it. It's a little lighter in body and color than a lot of IPAs, but it's massively hoppy and bitter. Good stuff. This is one pig that doesn't need any lipstick. Blind Pig is less big all around than Pliny the Elder, RR's show-stopping double IPA which you might have tried at the Oregon Brewer's Festival -- less malt, less hops, less alcohol. For those of us that love some hops, it's hard to say enough good things about Pliny, it's an incredible beer, and I think I'd almost always choose it over Blind Pig. Still, if you wanted something lighter, or if it made sense to drink a 6% beer instead of an 8%, crack open a Pig. Naturally you can find Russian River beers at the specialty places like Belmont Station, but I picked up this bottle at Pastaworks on Hawthorne, which keeps a small but brilliant beer selection. New Seasons often has them -- especially the cork-stoppered Belgian Damnation -- but I had to ask them to find me a Pliny from the back the one time they had it in stock. Does anyone know, are those the only 3 RR beers shipped to Oregon? There's another Blind Pig beer you'll sometimes see on tap around Portland, a dunkelweizen from Leavenworth (a.k.a Fish Brewing). It seems to be a regular at Clay's Barbecue on Division, and it was a guest tap at the Tugboat last time I was there. Labels: california, retail, where do I find...? those are the only three that I've seen in bottles. (belmont station occasionally has others on tap). 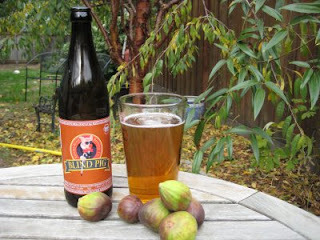 Ahhh.... only last night I was singing the praises of Pliny the Elder to my brother as Mila nodded her approval. Also on the songlist was Hop Czar. I'm glad I got into their line at the OBF early on. It was seven miles long by mid festival, thus some of us were enticed to go for the short lines and be served such things as sour beer and habanero beer.